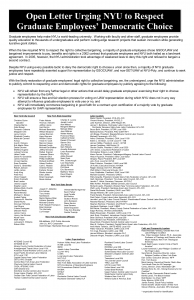 A petition with signatures from over 250 political, community, faith, and labor leaders calling on NYU to respect our democratic choice on unionization and bargain with us upon certification of majority support for GSOC-UAW. In the Spring of 2013 elected political officials and community leaders joined graduate employees to deliver this letter to the university. Graduate employees help make NYU a world-leading university. Working with faculty and other staff, graduate employees provide quality education to thousands of undergraduates and perform cutting-edge research projects that sustain innovation while generating lucrative grant dollars. When the law required NYU to respect the right to collective bargaining, a majority of graduate employees chose GSOC/UAW and bargained improvements to pay, benefits and rights in a 2002 contract that graduate employees and NYU both hailed as a landmark agreement. In 2005, however, the NYU administration took advantage of weakened laws to deny this right and refused to bargain a second contract. Despite NYU using every possible tactic to deny the democratic right to choose a union since then, a majority of NYU graduate employees have repeatedly asserted support for representation by GSOC/UAW, and now SET/UAW at NYU-Poly, and continue to seek justice and respect. NYU will immediately commence bargaining in good faith for a contract upon certification of a majority vote by graduate employees for UAW representation.